Angel Food Cake. © Denzil Green / 2008. 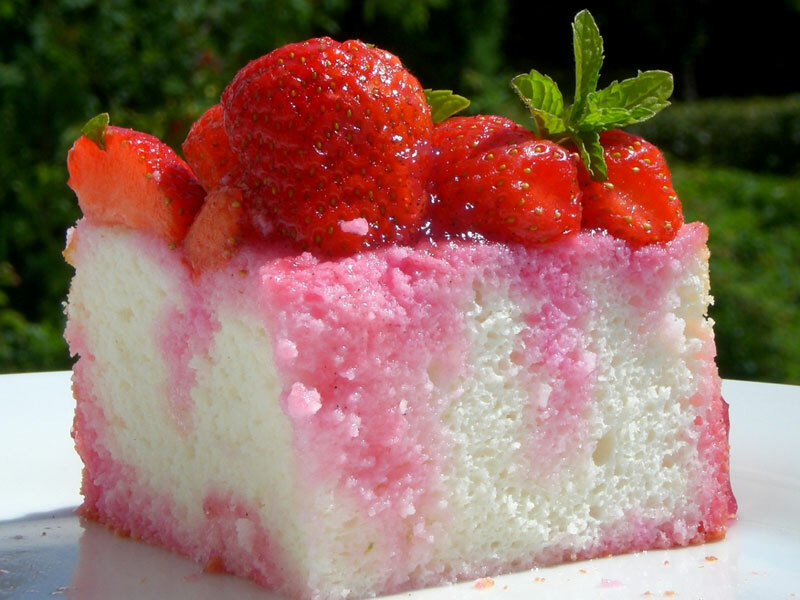 Angel food cake is a foamy sponge-type cake about 10 cm tall (4 inches) based on whipped egg whites. It can be plain, frosted, glazed, garnished with fruit, or dusted with icing sugar or cocoa. No leavener other than whipped egg white is used: no baking soda, and no baking powder. Recipes call for anywhere from a dozen to 16 or more egg whites. You beat the egg whites to a soft peak separate from other ingredients, then fold them in. It is not a true sponge cake in the purest sense, as it omits the egg yolks. 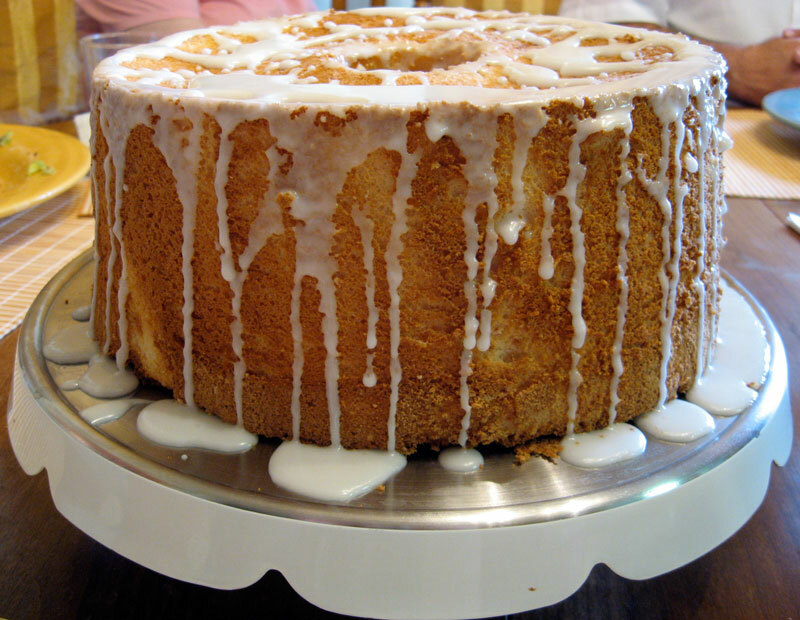 Angel food cake contains more sugar than other sponge cakes do, because sugar is needed to help provide structure, particularly in the absence of egg yolk. This makes it definitely not a low-cal dessert, despite its light taste and texture. There is no butter, lard, shortening or oil in it — no added fat at all. 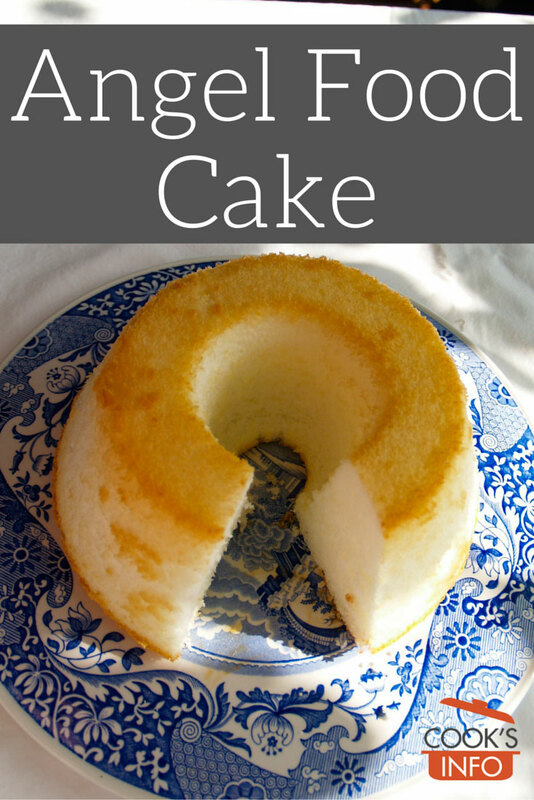 Angel food cake needs a special pan, a tube pan, ideally one with a removable bottom. The tube in the middle of the pan not only helps the cake cook more evenly, by allowing ventilation in the middle, it also gives the cake more surface to cling to as it rises, and after baking, helps the cake to cool more quickly and evenly. You don’t grease or line the cake pans. The sides in fact must be ungreased: the batter needs to be able to cling to the sides of the pan, to give it something to hold onto as it rises. The top of the cake will crack a small bit. Angel food cake is best cut with a serrated knife. There are also special angel food cake cutters. It makes a light summertime dessert. Some people like toasting leftover angel food cake for breakfast. Assume eggs called for in recipes to be large. You can use small eggs, but use more accordingly. Leftover yolks can be frozen. Alternatively, you can save up egg whites over time from recipes that didn’t want them, freezing them, and then thawing them to use for angel food cake. Alternatively, this could be a good time to buy a carton of egg white. You’ll need a very large bowl to beat the egg whites in, as a lot of egg whites are needed, and they will expand greatly when beaten. The egg whites should be room temperature before being whipped. Some recipes will call for a small amount of cream of tartar to help the whites mount better. Some say after you put the batter in the pan, drop the pan (right side up, obviously), on the floor a few times to encourage large air bubbles to come out of the batter (that might otherwise deform the cake when it starts baking). All recipes emphasize heating the oven in advance, and getting the cake into the oven as soon as the batter is ready. The idea is that the egg white component will quickly lose the air that you have beaten into it. However, most home cooks have found that up to a 10 or 15 minute delay doesn’t seem to make much noticeable difference. That being said, you won’t want to delay unless there’s a good reason to. Let the cake cool in its pan; don’t make the mistake of trying to remove it any sooner. It will take at least 2 hours to cool. Most people recommend cooling the cake by turning the pan upside down and setting the tube part over the neck of a stable bottle. Turning it upside down for cooling helps prevent it from collapsing as it cools. When it is cool, you then run a knife inside the pan around the edges to loosen the cake. People watching their weight like angel food cake because, though like other cakes it is still high in carbohydrates, at least it is fat-free. It freezes very well. Some say it even slices better once it’s been frozen, then thawed. Angel food cake seems to have been “invented” around 1870. By 1883, it was a favourite dessert of Lucy Webb Hayes, the wife of American President Rutherford B. Hayes. In 1884, a recipe for it appeared in the Boston Cooking School Cook Book. This recipe, called “Angel Cake”, had similar ingredients as we use now, but called for the pan to be lined, and for the cake to be turned out of it while still hot. Two years later, in 1896, Fannie Merritt Farmer took charge of the Boston Cooking School Cook Book for its next edition that year. She kept the name Angel Cake, and provided a separate recipe for a frozen dessert called Angel Food. Fannie changed the directions, though, and called for the cake to be baked “in an unbuttered angel cake pan.” The Boston Cooking School Cookbook, 1896 edition, page 418. There are some cakes from the period that some people feel to be similar, such as Cornstarch Cake, Snow Cake, Snowdrift Cake, etc, but these all used fewer egg whites, used a fat of some kind, had you grease the tin, and didn’t need the special tubed pan. Some surmise that the cake might have originated in Pennsylvania, based on the preponderance of angel food cake tins from that area still extant. That may, however, just show that the cake was relatively more popular in that area, or that householders were more frugal and didn’t discard their tins. As well, south-eastern Pennsylvania had many industries that made the tins, so they would have been easier to procure there. Angel food cake requires lots of beating, but rotary hand-powered egg mixers had been invented by the 1880s, so even though some writers surmise that it would take hours of beating, housewives ambitious enough to make the cake would probably also be the type inclined to use the new time-saving kitchen gadgets coming out at the time. 1. ↑ The Boston Cooking School Cookbook, 1896 edition, page 418.